Several students in the University of Maine at Presque Isle’s Business Program had their first experience giving a presentation before a group of professional CPAs, attorneys, insurance brokers and financial advisors when they participated in the Aroostook County Tax Seminar held at UMPI on Oct. 31. The students delivered their income tax and retirement plans update presentation during a morning session. Other topics for the day included an update from the Social Security Administration on retirement benefits, an update on the Affordable Care Act, estate tax planning, and charitable estate planning. According to UMPI Assistant Professor of Business and Accounting Stacey Emery, this was an important training and skills-development opportunity for her students. 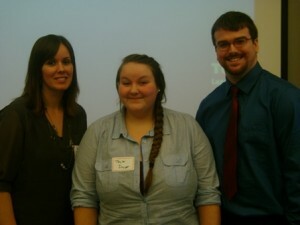 Four students—Farren Sutherland, Nicholas Parks, Taylor Dwyer, and Brandon Bonney—delivered the presentation. The students spoke on a range of topics, from the new IRS regulations surrounding Qualified Longevity Annuity Contracts (QLACs) to the income tax changes for 2014. For several years, the sponsors of the Aroostook County Tax Seminar have invited UMPI students from the Business program to attend the event. This year, they suggested having the students present rather than just watch the seminar’s proceedings. The Aroostook County Tax Seminar was started 39 years ago by concerned area professionals who saw the value of having experts come to Aroostook to speak on topics of interest. Today, it is still organized by a committee of professionals including an attorney, a life underwriter (insurance broker), a CPA and a financial planner. For more information about UMPI’s Business Program and the opportunities it provides its students, please visit www.umpi.edu or contact Emery at 207-768-9603.